Good-performing amplifier in a lightweight and compact package, features internal switchable low-pass filters and clip limiting. Good performance, low distortion and low weight. 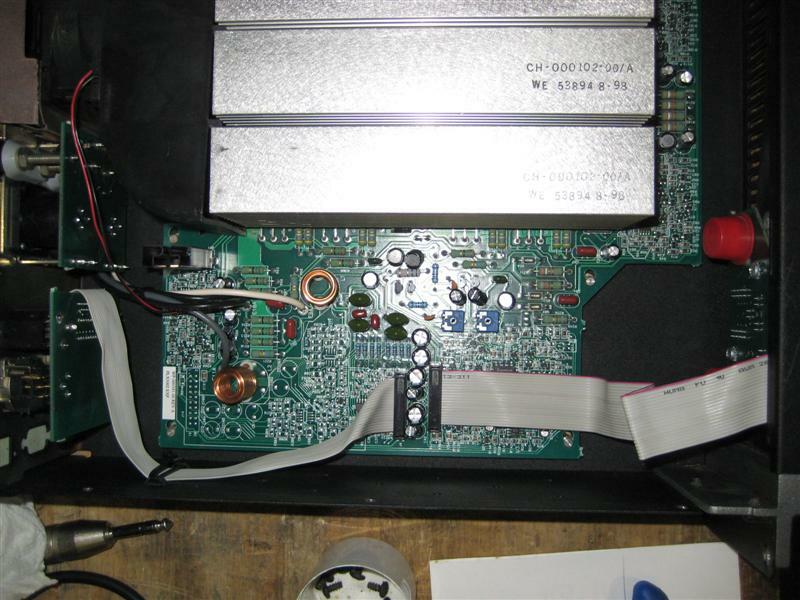 Amplifier internals and front panel. Note the circuitry hangs upsidedown in the casework. 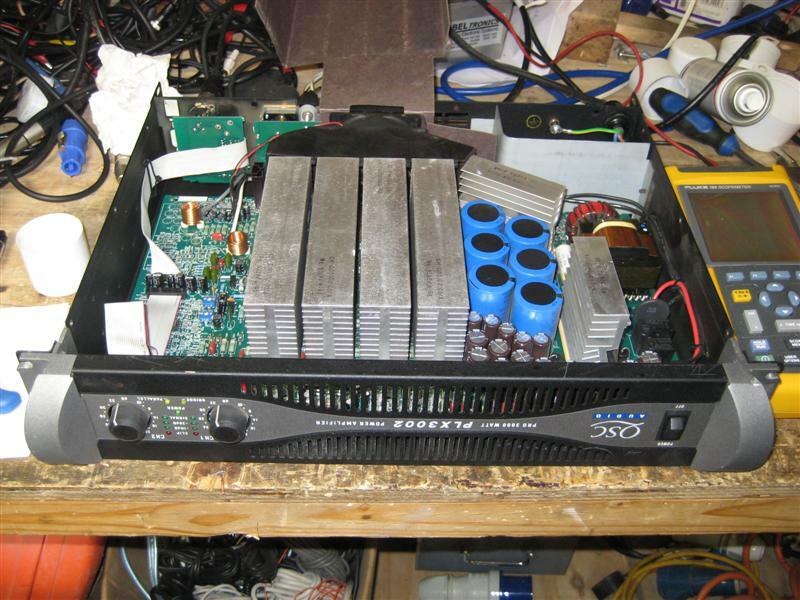 Amplifier top view. 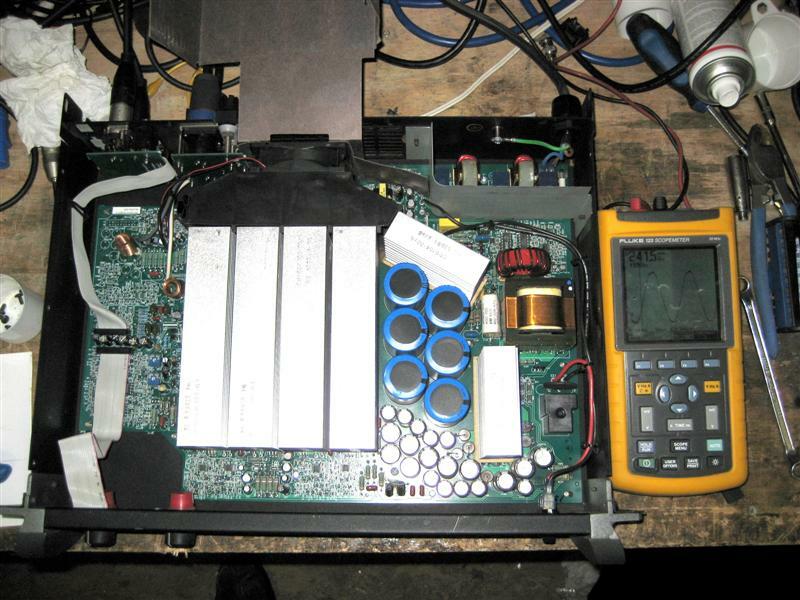 The switched-mode power supply sits towards the right of the image and the amplifier circuitry sits under, and to the left of, the four heatsinks in the middle. Another shot of the internals. 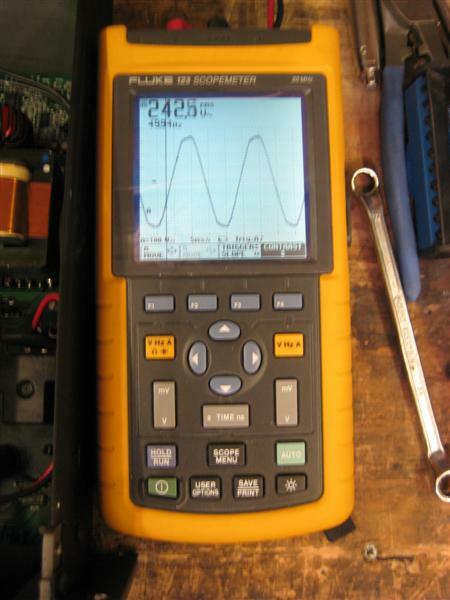 The scopemeter shows the mains voltage and waveform (full power, 4R). 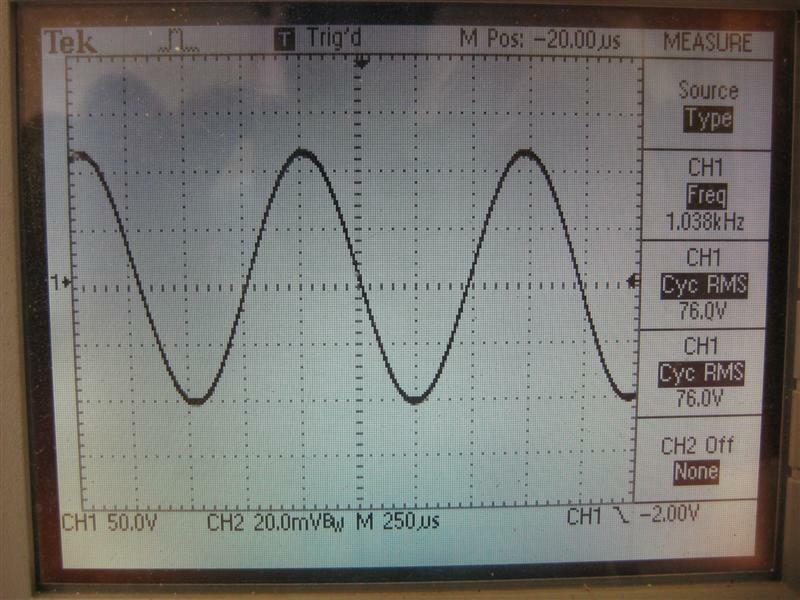 Mains voltage and waveform (full power, 4R). 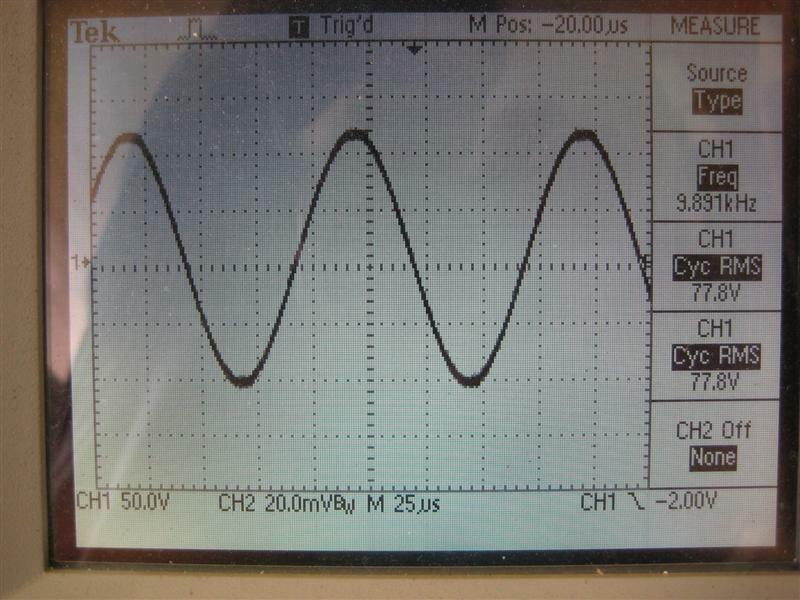 Harmonic distortion of the mains is clearly visible, and is better when the amplifier is not running. 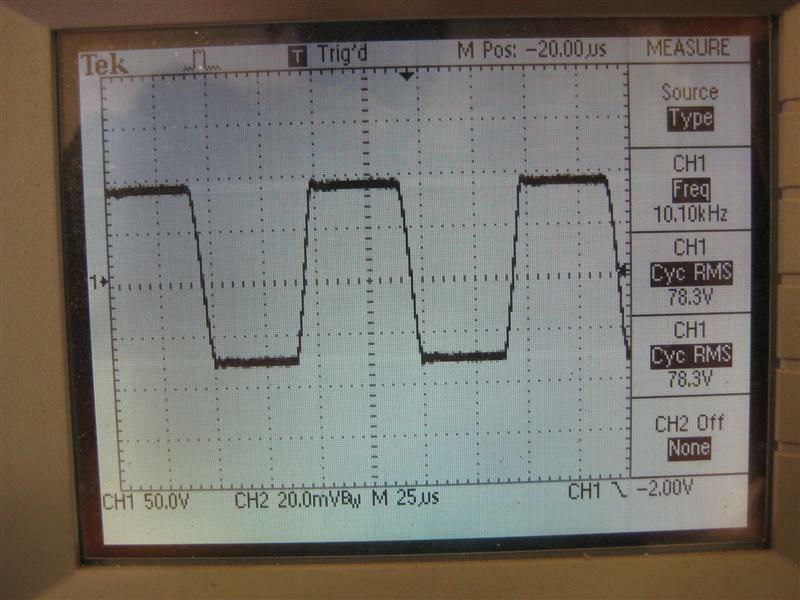 This is due to the poor power factor of non-PFC power supplies operating from a finite mains impedance. 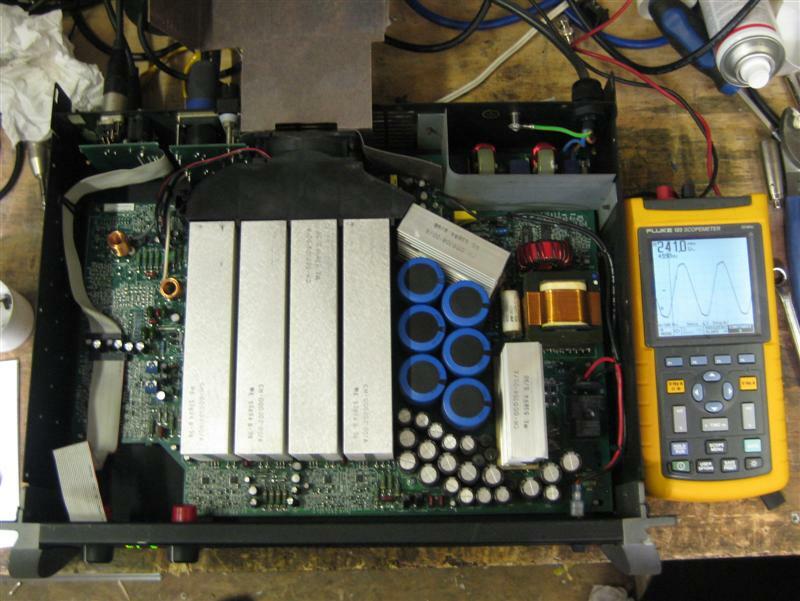 Close-up of the switched-mode power supply. 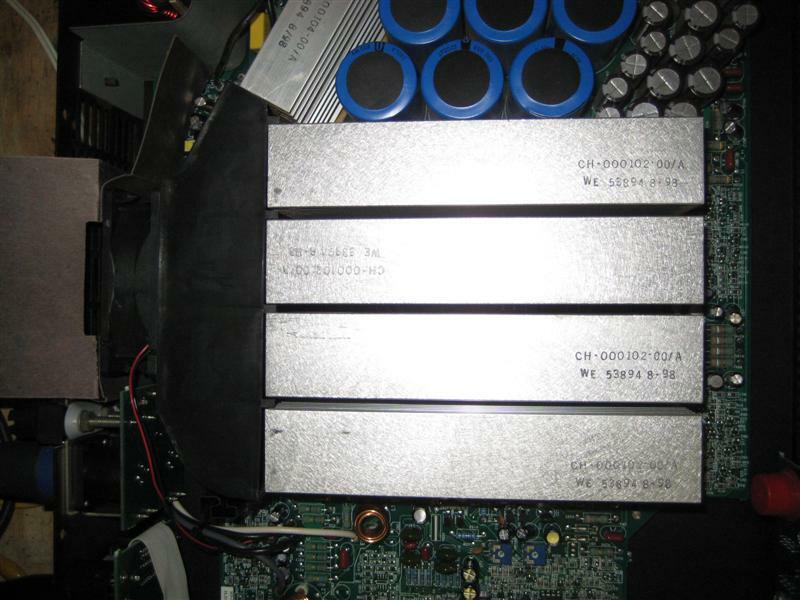 The four amplifier 'live' heatsinks connected to the output signal. 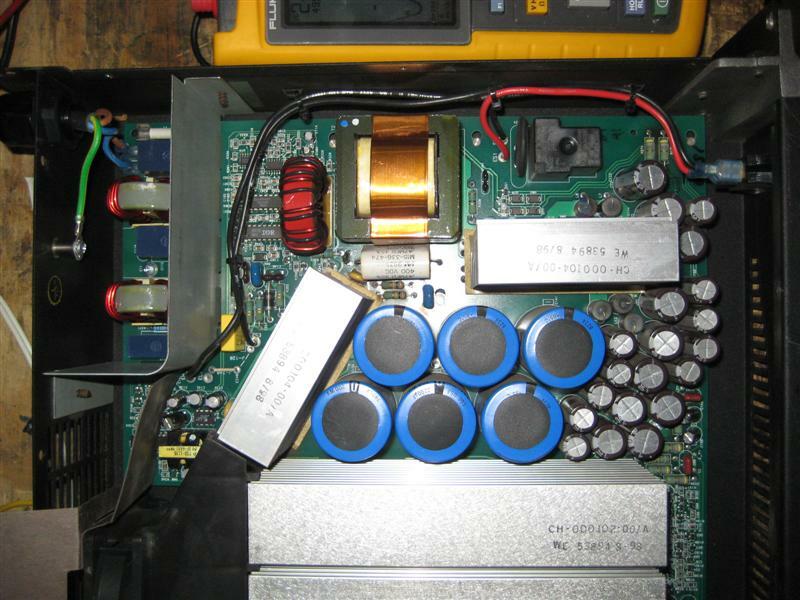 Amplifier driver circuitry showing a mixture of surface-mount and through-hole components. 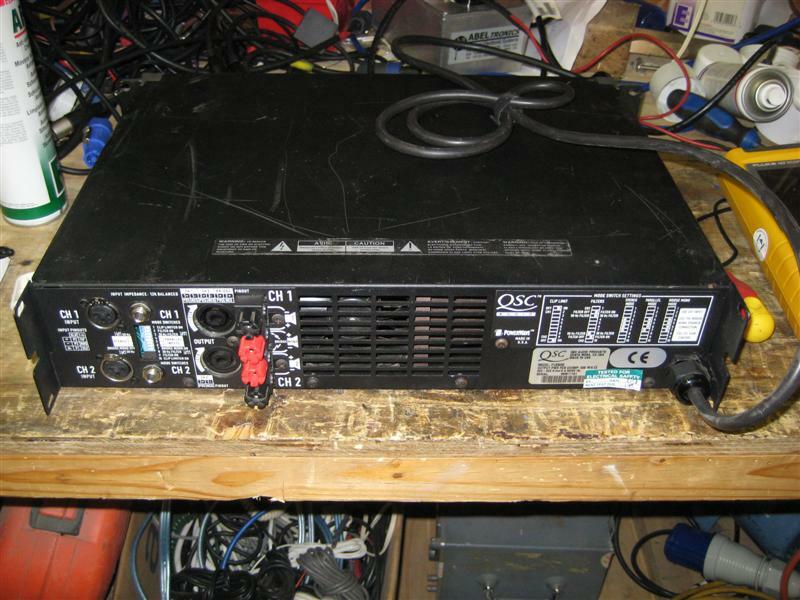 1kHz, 4R, full power. Perfect. 1kHz, 4R, clipping. Excellent behaviour with no nasties or parasitics. 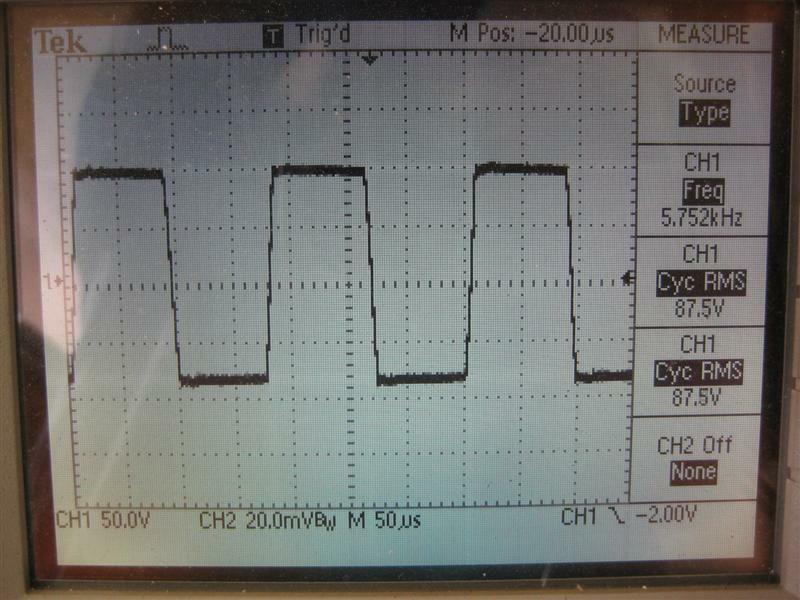 6kHz square wave, 4R, full power. Slow-ish rise and fall times, but excellent performance with no overshoot or ringing. 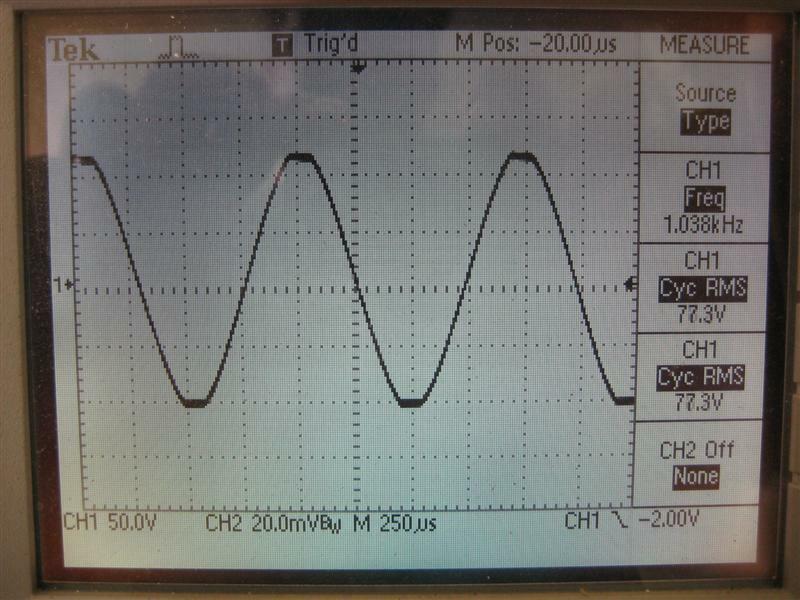 10kHz square wave, 4R, full power. Again, slow-ish rise and fall times (approx 17v/us), but excellent performance with no overshoot or ringing. 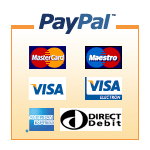 10kHz, 4R sine wave, threshold of clipping. Very good indeed.